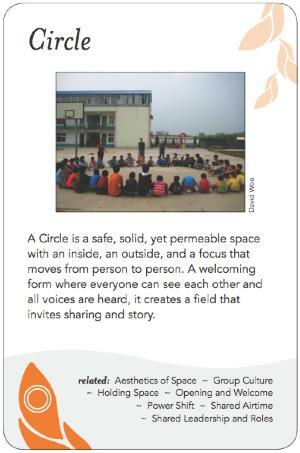 A Circle is a safe, solid, yet permeable space with an inside, an outside, and a focus that moves from person to person. A welcoming form where everyone can see each other and all voices are heard, it creates a field that invites sharing and story. Every room needs a centre; this is a pattern of architecture. It is the centre that holds the space open, holds it together, and holds it safe from outsiders ("circling the wagons"). Its form is egalitarian, flexible. It can be widened to accommodate more, and narrowed when people leave. It is at once open (so all voices can be heard) and private (so that those not invited cannot interfere or disrupt it). It is by nature iterative -- the talking stick is passed around the circle until there is nothing more to be said. As such it invites story and performance, around a focus (a campfire or a large table), or where the storyteller or performer herself can enter the empty centre of the circle and 'turn' to each person in the audience. The centre of the circle is the pivot, the focus, and the essence of the circle even when it is empty. The centre represents the purpose and intention of the group. It is not the outside of a pot, or a room, that is essential, but the empty space each creates inside, where its purpose is realized. It is the whole in the centre of the wheel that holds it from flying apart and from collapsing in on itself. When one speaks to the circle one speaks to the 'empty' centre, to the focus, to the whole group, not to any individual -- it is a conversation not a dialogue, and this arrangement prevents people directing or taking things personally, or personal arguments and sidebar discussions from erupting. The Circle Way involves mutual agreements to listen, to ask for what is needed, to offer, and, in sequence, to check in, to respond to a 'central' question, and in one sentence to check out at the conclusion of the circle with 'what is to be done next?'. We are not built to sit in lines or in squares, but in circle, as peers, as community. The physical space should be arranged in a circle, with a focus and room for people to enter the circle and the centre. The room, the light, the chairs, the air all matter, as most of us aren't so comfortable in meeting rooms. Hospitable space awakens the forms of knowing that we need to deal with what we're dealing with. The point of focus - when it's not in the centre of itself - is like a wobbly wheel with spokes broken (the danger of powerpoint slide projection dominating the axis of focus of attention). Chris was working in Alaska, with an aboriginal Child Welfare Authority, sitting in a board room, (bored room?? ), trying to figure out what the next level of our work was going to be, and we had a whiteboard at one end fo the room, and began sketching on flip chart paper hanging on the flipchart. The power in the room lay with whoever was at the flipchart, had the power... we met for 8 days in conversation...people came and went out of it, the dynamic of the power in the conversation shifted completely when Chris took the flipchart off the wall and placed it in the centre of the table, where everyone could have access to it, and this completely changed the nature of a group of people working together. In any group, whatever size, when you put the focal point of the group's work in the centre of the group, rather than at an end of the room, it becomes more co-creative, collaborative, cooperative.